Wow. We did it. 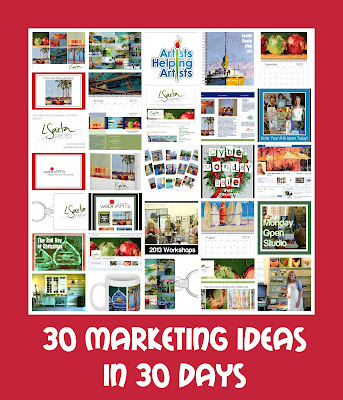 Thirty days of marketing. You should probably take a minute to pat yourself on the back. Even if you haven't completed all of the challenges, I am sure you are way ahead of where you were a month ago. Many of you have "to-do" lists and that's great too. 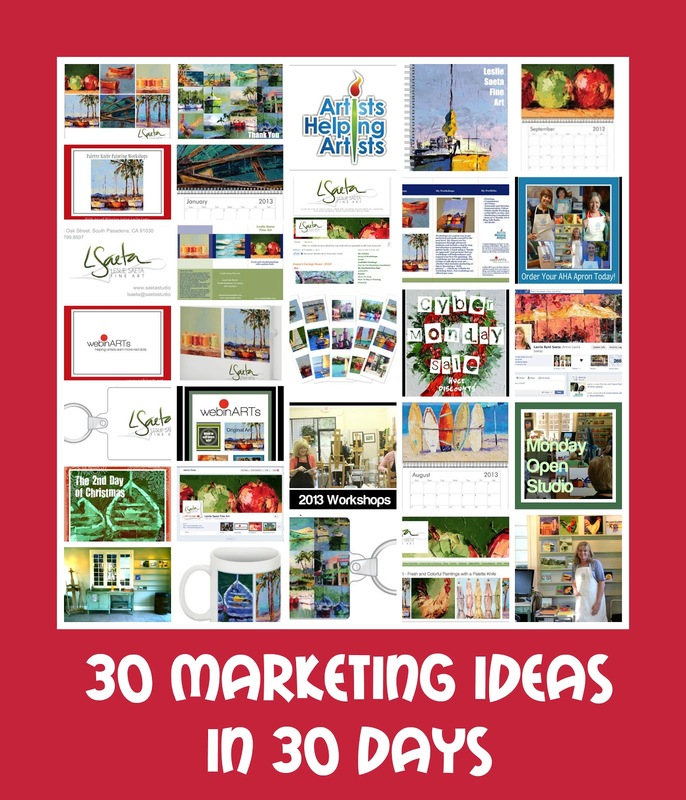 You can take all the time you need to go through our 30 Marketing Ideas. Just remember to have fun while you are doing it. Our Day 30 Challenge is all about giving back. I truly believe that as artists we all need to help and support each other. So today we are going to give back. And I will start first. First off, I want to thank you all for joining me for this Challenge. We ended up with over 400 artists participating. That's amazing. 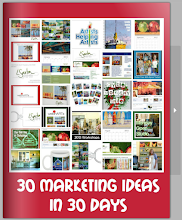 I have created an ebook of all of the 30 Marketing Ideas from this month. You can download it here for free. It's also located on the right side of my blog - just look for the "30 in 30" photo. Please share it with your art friends as I do think some of these tips can really help artists share their art. I also created a flipbook of the document which you can view below. Click the "click to read" box to enlarge it. Have fun! Secondly, if you want to try out one of my webinARTs classes, I am offering all of you a $40 discount on either the 101 or 102 class. Just go to the webinARTs website and sign up for the May101 or May102 class. Use the coupon code 30in30 and you will save $40. This means you can take the class, at your own pace since it is online, for only $139.00. And you will have access to the class blog for one year. All of the classes are already posted on the blog so you take your time. Just be sure to leave comments on the blog if you have any questions! Finally, I am going to host a 30 Paintings in 30 Days Challenge in September. I hope you will seriously consider joining me. 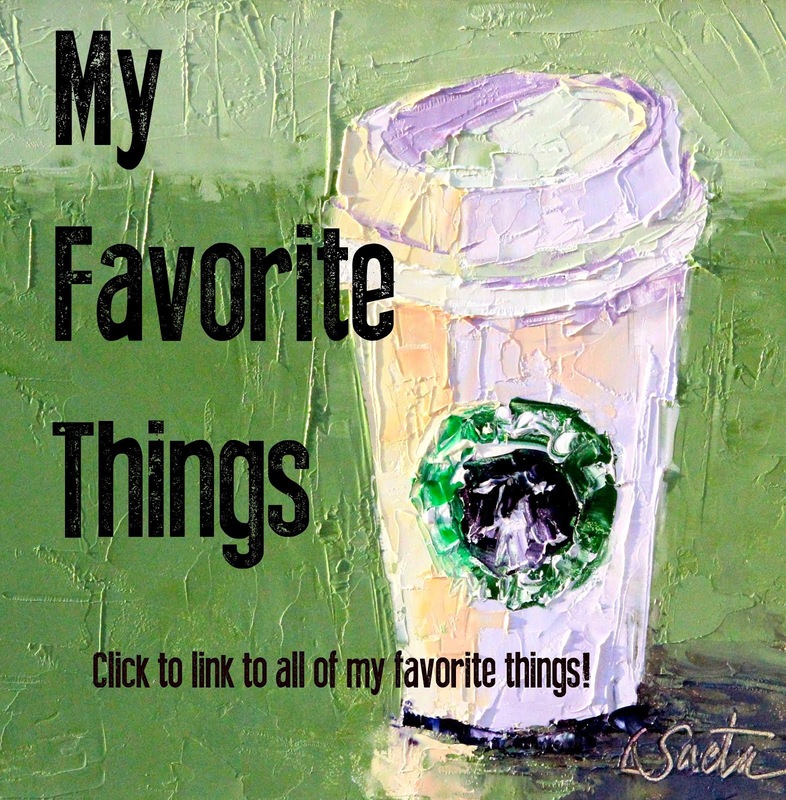 You can post your new painting everyday on my blog which REALLY helps with visibility. Last January I had over 40,000 hits on my blog during the first 30 in 30 Painting Challenge so not only will you paint more, but you will also get your art seen by a lot of people. I am sure you all have a busy month in September but that doesn't matter. It's ok to paint more than one painting in a day, it's ok to paint ahead and it's ok if you paint less than 30! If you are in for the Challenge spend a little time getting prepared this summer to make sure you have plenty of canvas or canvas boards and lots of painting inspirations. Of course none of us were prepared for the January Challenge and we all survived just fine. Ha! So? What do you do need to do for our last Marketing Challenge? Give back. Today is the day to share and tell the world about one of your fellow artists. Go to Facebook and SHARE a post from one of your favorite artists. Blog about someone who has inspired you or whose art you absolutely love. Pick up the phone and call you art buddy and tell them how much you appreciate them. Whatever you decide to do will be great. Because it is all about giving back and supporting each other. And that's the best kind of marketing there is! I cannot believe there are only two days left in our Challenge! I thought long and hard about what I should post for the last two days. What do I think is one of the most important things to marketing your art? Staying organized. Because without it you will never get ahead. No matter how hard you try! My family technically "ditched me" this holiday weekend. My middle son came home from college but went to visit his brothers and my husband went to Kentucky to play in the Volleyball Nationals. So I decided to use these three days to completely re-organize my office and studio and to put in place some new systems for my art business. Wow. What a difference a few days make. The problem with being organized is staying organized. At least it is for me. 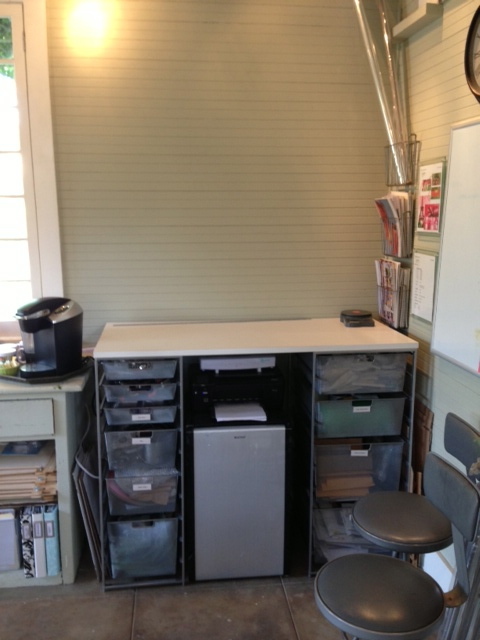 So my project this weekend included creating a shipping/framing area in my studio (pictured above), cleaning out every drawer, cupboard and shelf and adding ipad holders for all of my workshop students. I also re-did my expense recording system (the old "system" wasn't really a system) and all of my expenses are now recorded in receipts2go. Plus I completely reorganized my office which took almost an entire day. 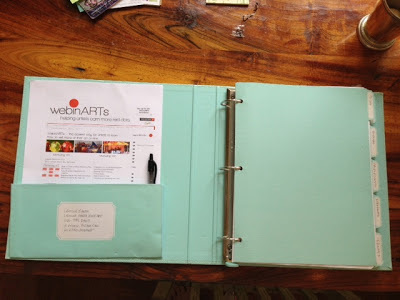 I created an Art Binder earlier in the year and it has been the most valuable tool I have for staying organized. The tabs are: To Do, Paintings, Sales/Commissions, Workshops, WebinARTs, AHA, Events, New Ideas, Merchandise, Newsletter, Books, Open Studio, On-line Painting Classes ... I am sure more tabs will be added. Every idea, to-do list and thought is put in this notebook! So the Day 29 Challenge is to start getting organized. Make a list of all of the things you know you need to do. Make an Art Binder for your business if you think that will help you to keep all of your ideas and tasks in one place. Then prioritize the list and tackle one item today. You will soon be well on your way to getting organized. And once that happens, you can focus on marketing your art. I am asked all the time why I don't add a watermark to my images posted on line. I am not sure exactly why I don't do it. But it is something I think about all of the time. I used to think it was just too much trouble and a hassle to add a watermark. But recently I discovered a free online program called Picmarkr. It took me about 30 seconds to add a watermark and the program offers lots of options. You can add the image just about anywhere on the photo and you can choose white ink, black ink, etc. 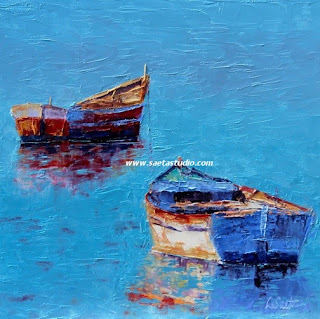 Here are two different options I used to watermark one of my newer paintings. Posting your artwork online is crucial to getting your art seen by others. If you are worried about dishonest people stealing your image then add a watermark. It's your choice! The Day 28 Challenge is to try Picmarkr, as it is a free online program. It takes less than a minute to watermark one of your images. Even if you don't decide to use it, book mark the site because you may need it later. There are a lot of social media options available for artists to showcase their art. With a new social media site popping up every week, I have found it a bit overwhelming. So I have tried to limit myself to using just a few. To get started on Pinterest, first set up a profile that includes keywords and your website address, then start pinning. When you pin your art, be sure and include keywords: Pinterest is searchable, so make sure you describe your pin clearly. You should also customize the link to point back to your website or the page on your site where the painting can be purchased. You can also get more exposure for your images by including a price for the item into your description. This simple trick will add your pin to the “Gifts” section on Pinterest and will display the price across the front of the image throughout the site. In the past few weeks Pinterst added a new feature called "rich pins". This is a new service that allows a retailer or small business to sell products directly on their Pinterest site. But, it's a bit complicated (and I am still trying to figure it out). For more information go to the Pinterest site here. The Day twenty-seven challenge is to set up a Pinterst account if you don't already have one. Then, all of you, new or old to Pinterest, should post ten paintings to your Pinterest site. Include key words, prices, a link to your website where the painting is for sale (and a watermark, if wanted). Have fun and try not to get distracted with all of the great pictures and ideas! Check out my upcoming palette knife painting workshops and my webinARTs classes. The Day twenty-six Marketing Challenge is to make this quick change if your Facebook Fan page needs it. If you have already done it, then enjoy your day off! Your Facebook Fan Page can show a brief description of approximately 155 characters that displays below the cover image and the profile image at the top of your Page. This is great space to outline a concise statement about your business and list your website URL. To update this area, go to Edit Settings in your admin panel, and under Basic Information look for Short Description. As you can see in the photo above, I recently added a short bio and included the link to my website. For the Day twenty-five challenge, go to your Facebook Fan page and add this short description to your page. Be sure to include a link to your website or blog. Many of us spend a lot of time on Facebook. I will admit that I am pretty addicted. For me Facebook is a wonderful way to share "current events" about my art, that is ... what's happening right now. But have you ever wondered how well Facebook is working for you? There are two very cool sites that you can visit to get an idea as to how well your pages are doing compared to other pages similar to yours. And of course they are free. I will warn you though. As well as I thought I was doing posting on Facebook it appears I still have a lot of work to do! Now, I know that about 90% of my posts are on my Profile Page and those aren't reflected in this study. But don't be dismayed with the results. Instead, look at the recommendations and learn from the feedback. It's awesome information! So the Day Twenty-Four Challenge is to use at least one of these links to see how your Facebook Fan Page is doing. Please note, these only work for Pages, not your Timeline or Profile Page. Today is the day we are going to get more people to like you. That's right. I am hoping that by the end of the day you will have a LOT MORE FRIENDS. First off, you might want to create a photo badge similar to the one I created in ipiccy for my Facebook Fan Page. I am referring to the Profile Picture on my fan page that says "LIKE MY PAGE" with the big red arrow. I am pretty straightforward in my approach but it has worked really well! As you may have guessed, the Day 23 Challenge is to create a badge like this (or something creative ... just make sure it is as obvious as mine). Secondly, you need to also post on ALL of your Facebook pages that you would like everyone to like your page. Why? Asking people to like a post on Facebook works — it results in twice as many likes and comments as not making that simple request. Oil, 24" x 18" framed. I mentioned on yesterday's post a few of the the APPS that I use for my business. My list goes on and on ... but in my studio I love accuview and pandora. Accuview has a great grid and value finder program and it's probably the most popular one with my students. Pandora is my favorite station to play music. O-snap is what I use to record my demos. I put my iphone on a tripod and set the camera to snap a photo every minute. Then I just paint and don't worry about remembering to record my video! I use picstitch on my iphone to create collages right on my phone. It's a great way to post a collage of photos on the go. For my art business I am hugely addicted to invoice2go. It's is the basis for all of my financials and I love that I can create an invoice for a client on my iphone or ipad. Automatically all of the data is synced to my computer. You can just email an invoice and the client can pay you via paypal. It's simple and the reports are amazing ... sales by quarter or month or year ... sales by clients ... basically you can track and review any reports you will ever need for your business. Finally, I use both Square and Paypal Here to accept credit cards. I use Paypal Here almost exclusively as now I like the ease of having the money deposited only in to my paypal account. The Day Twenty-two Challenge is to incorporate a few of these (or other) applications in to your art business. If you don't have a smart phone there are many that you can use on your computer. They are great tools and will make your life a lot easier, I promise! The Day Tweny-one Marketing Challenge is to make sure you are caught up on all of the great APPS for your smartphone and tablet (ipad) that you can use for your business. Many of them are free but some cost money. I don't think many of them cost more than a few dollars and they are worth it! Here is the first day of "my" list. Please note that I have an iphone and ipad so I am going to speak to these devices. But please note that most of them are readily available for other smartphones and tablets. 1. The first thing you need to do is add a link to your website and blog to your phone and ipad. It looks like all of the other apps on your phone and is a great shortcut to your own websites. It's really easy. Open up your website on your phone. Then click on the symbol that has an arrow inside a rectangle. Then click on the "Add to Home Screen" button. That will take you to the screen below. Just name the APP for your phone. I named mine saetastudio. Once you are done it will appear just like an app on your phone. You should do the same for your blog. 2. Evernote. If you don't know about this app then you need to. It's amazing and I use it to mark and file websites and all good ideas I find on the internet. 3. Podcasts. This cool app lets you listen to all 155 Artists Helping Artists radio shows from your phone. Download the free app and then type in the AHA show. All of the new and old shows will be available for listening and it keeps all of the shows updated. More apps will be in tomorrow's post! If you have any great apps that you would like to share then please leave the information in the comments below! Believe it or not, we are two thirds of the way done with the 30 in 30 Challenge. Crazy to think isn't it? I just spent the entire day at the Balboa Artwalk which meant eleven hours in the sun but it turned out to be an absolutely gorgeous day. Sales were wonderful and it was great to not only meet new clients but also a lot of fellow artists! The Day Twenty Marketing Challenge is to write six goals for your art business. We have six months left in the year so plan on trying to accomplish one per month. Make sure the goals are realistic, attainable and measurable. Here is my attempt at coming up with six goals. (They are in no particular order). 2. Complete 30 paintings in 30 days during my September Challenge. 3. 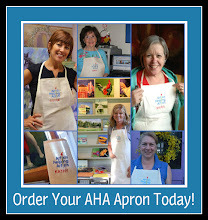 Schedule the AHA shows one month in advance (vs. two days in advance). 4. Finalize and publish my 2014 workshop schedule by July 1, 2013. 5. Catch up on my financials monthly instead of semi-annually. 6. Slow down a bit. Relax and enjoy life. So give it some thought. And write down six goals you would like to complete over the next six months. Adding videos on your website and blog can really attract new followers. I use to have a hard time adding videos to my blog as the size of the video never seemed to fit on my blog. So my blog post often showed only 2/3 of the video! The Day 19 Challenge is to watch this video. It's a great resource that explains how to resize videos to fit on your blog. Then if you are really inspired, resize one of the videos you have already completed and post it on your blog. If you live near the Newport Beach, CA area be sure and visit the Balboa Artwalk on sunday, May 19th. My booth will be at South Bayfront and Ruby Street. Stop by and say hello! A few weeks ago a friend of mine posted on her Facebook page that she was thrilled to have been selected as a Featured Artist on Jerry's Artarama Facebook page. When I clicked the link I thought it was pretty cool and I decided to enter my own art. Sure enough, two weeks later I was selected as the weekly Featured Artist and my art was on the cover of their Facebook page. 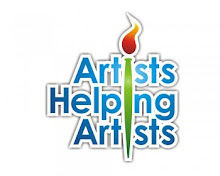 If you aren't familiar with Jerry's Artarama they are a great art supply store. Although I haven't ever actually visited one of their stores in person (I don't think they have any in California) I have ordered from them online. In fact one year they offered a groupon discount that was almost 50% off a $150 purchase. I was so excited about the deal that I posted it on Facebook. A ton of my artist friends took advantage of the special. It was awesome! Anyway, I ended up selling a painting as a direct result of being a Jerry's Artarama featured artist. So can you guess what today's challenge is? Go to Jerry's Artarama Facebook page. It's pretty entertaining as last week they ran a "sloppy studio contest". You might want to check out the photos. Pretty scary. But hilarious. Right below their Timeline photo you will see four photos. The last one says "Call for Artists ... Enter Fan Gallery". Click that link and fill out the form. Be sure to attach photos of your best paintings. Each week they pick 20 artists to be part of the Fan Gallery and one is selected as the Featured Artist. You can enter every week if you want. It's free to enter and you never know what might happen. 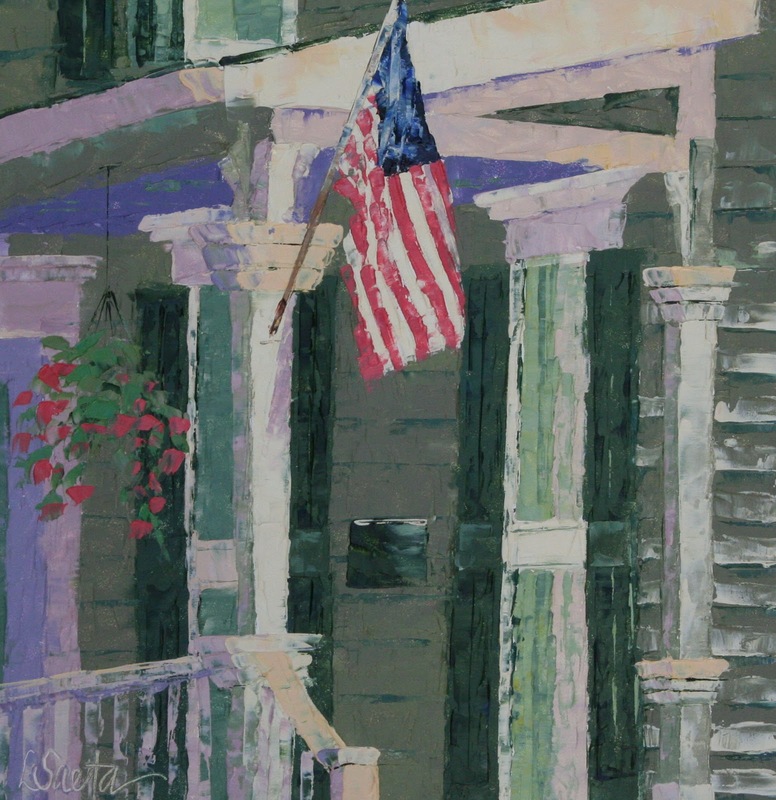 Click here to view and purchase painting. A social media "call to action" is an often overlooked element of an effective social media campaign. Social media sites (such as Facebook) get prospects, customers and the public primed to want to find out more about your art or to engage with you further. However, you always need to remember to lead them to the next step in your sales process. Regardless of the platform—blog, Facebook, Twitter, etc.—posts will receive better success rates if they contain calls to action, compared to ones without them. So, all the more reason to use them! On Facebook, posts that include the call to action to “share” one of your posts receive more shares, comments and likes. The Day 17 Challenge is to write a new post on Facebook, your blog or Twitter, but include a call to action. Ask them to "share your post". Or ask them to "leave a comment below". (Or why not ask a question to all of your readers about what you should paint tomorrow?) Sometimes just the act of inviting someone to share your post will be the encouragement a fan needs to take your suggestion. Once they share the post, it will travel on further to their colleagues, friends and family, thus expanding your reach. This is truly one of greatest benefits of social media! Most of us who have a blog have been offering our visitors the chance to "follow our blog". When someone becomas a "follower" they automatically receive an email notification when a new post is published. Most blog authors aren't aware there is a way you can access all of these email addresses of your blog followers. So, the Day 16 Challenge is to send an email to all of these followers to see if you can add them to your newsletter mailing list. Of course, first you need to figure out where to find the list. This website does a great job showing you how to find and download a copy of all of the email addresses. Just follow the link and simple instructions. If you haven't already added the opotion on your blog go to Layout, then Add a Gadget and insert the widget called Follow By Email. It's very simpe and a great way to build your followers. If you are feeling a bit overwhelmed as you don't yet have a blog or newsletter, then you might want to sign up for my webinARTs 101 course. In a month you will learn how to create an art website, a blog, sell your art on Facebook and send out a newsletter. The classes are all self paced and online so you can take as long as you want to finish the class. It' not too late to start the May class. For more information or to register, go to the webinARTs website. Holy smokes. It's Day 15 which means we are half way through the Challenge. It's hard to believe. But you all deserve a huge congrats for making it this far! The Day Fifteen Challenge is fun. Today you need to give some thought about how you would like to package your art before it is shipped. 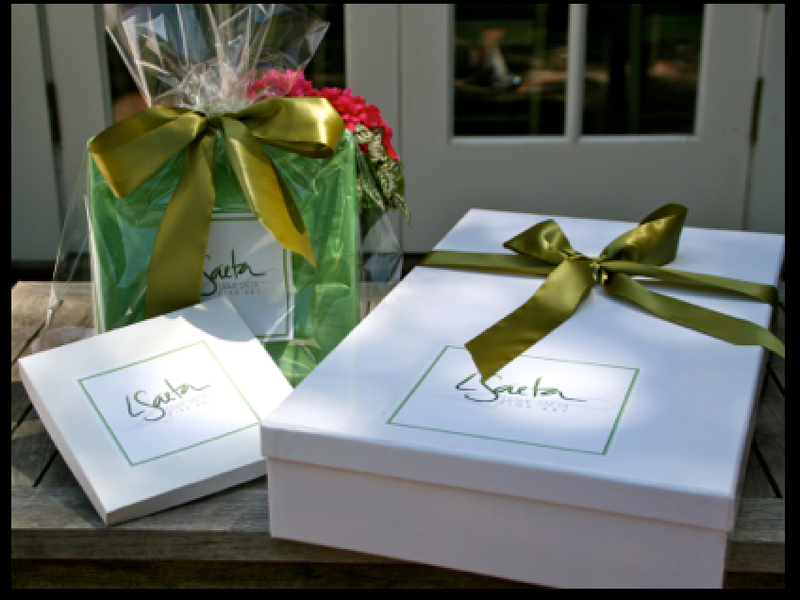 I have always believed that opening the box should feel like Christmas to my buyers. Today I received a message from a new buyer that read "Hi Leslie, the painting arrived today and is absolutely beautiful! 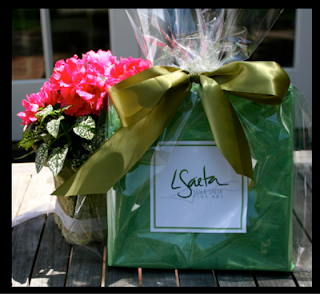 The ribbon is such a nice touch - it made me feel as though I were unwrapping a wonderful gift! Thank you so much for the beautiful note cards, as well! They're so pretty that I hate to send them away!" Now that is how I want every buyer to feel! So now it is your turn. 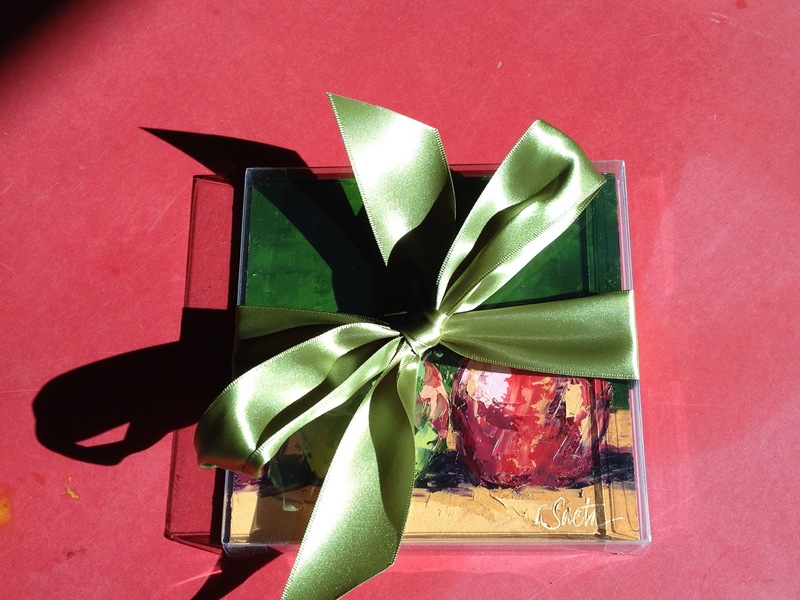 Decide on how you want to "gift wrap your paintings". Shop the internet and get some inexpensive supplies. (You can try one of my favorites like Paper Mart). Be creative, have fun and make your buyers "unwrapping experience" feel like Christmas! The Challenge for Day 14 is to offer something free on your blog today. It can be anything ... a free download offering a studio tip, a helpful hint for collectors, a contest with a free prize (such as notecards, a calendar, etc.) ... anything. Share it on your blog and be sure to post it on facebook. Then add the link below so all of us can have a chance to win or get something free! Seriously though, you can create some excitement and interest on your sites by offering a free giveaway. But don't be shy about asking the potential winner to do something to be entered in the contest. You can ask them to sign up for your newsletter or just comment on your blog. Keep it simple and have fun! Day 13 of the Marketing Challenge is a good one. But this one is going to push you a bit out of your comfort zone. Today you need to get out of the studio and head in to town and talk to someone local about your art. Now I know you are wondering what I mean by "someone local". Ideally, you will go to a local store, restaurant, furniture store or interior designer. Grab a business card, your ipad and some photos of your art and just walk right on in. Tell them about your art and explain that you would like to sell your art at their business. Be prepared to pay them a commission (of course) so you will need to think about it first. But don't think about it all day and then convince yourself that it's too late to head out in to town. I know I am asking a lot. But this could be huge for your art. And if you have a story to share about this Challenge, please post a comment below! Oil, 6" x 16" on canvas panel. I am hoping this challenge takes you only about five minutes. Since it's Mother's Day, you deserve an easy one today! Enjoy this special day to hug your mother, children, sister, husband or friend. Being a mother is the best job in the world. Enjoy! I recently came across a wonderful list titled 30+ Places to Promote Your Art. 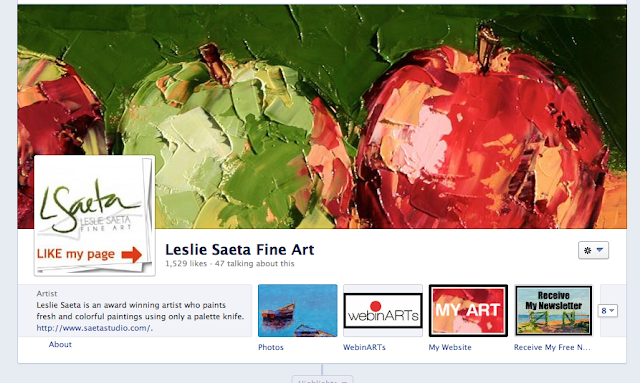 It's a list of more than thirty online sites where you can promote your art and many are free. It's a great resource and I think you might find some of these are a great place for you to get your art out there and seen! There are at least ten websites listed that are free. So the Day Eleven Challenge is to select at least one of the free ones and add your art. You never know what can happen and the more places your art can be seen the more likely you are to sell! If they are free, I always ask, why not? 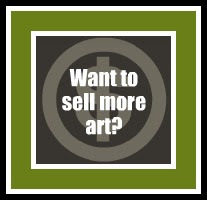 Most artists would like to have their art sold in Art Galleries. We know that when people are looking for art they usually head to art galleries. But getting your art in an a Gallery is an entirely different story. The Day Ten Marketing Challenge task is to start researching potential galleries where you can sell your art. The last thing you want to do is contact a gallery before you are ready. First off, you need to start a list of all of the galleries where you would like to show your art. The database can be in the form of a list, notebook or spreadsheet, it doesn't matter. Next you need to peruse the websites of each gallery and read what their specific guidelines are for submitting artwork. Print out a copy and keep this information organized by gallery name. Did you know the best way to get your art seen by a gallery is from a referral of an artist currently showing in their gallery? 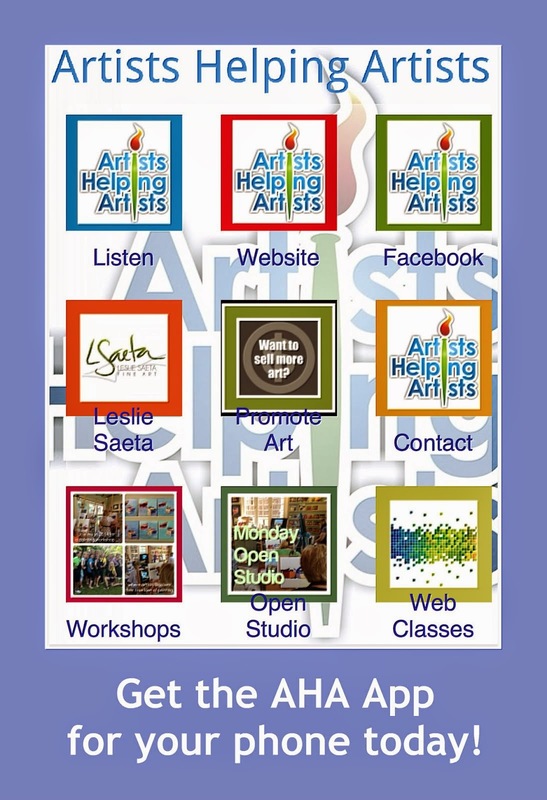 Look at the galleries list of current artists. If you are lucky you might know a few of them. 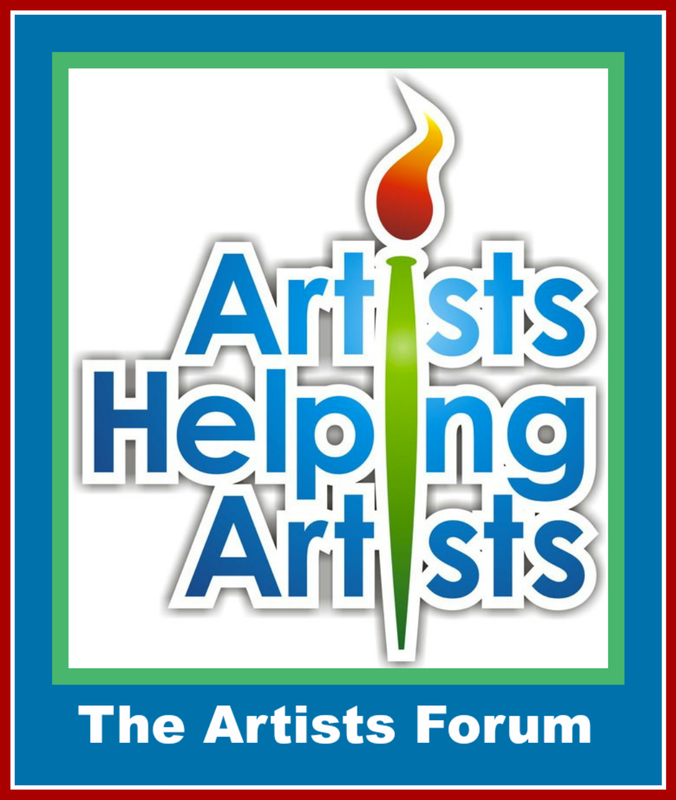 Visit their websites and learn as much as you can about the artists they already represent. Of course you need to visit the galleries (if they are nearby) and get to know them. Study the art, prices, artists, styles, etc. Based on the gallery submission guidelines start a "to-do" list of all of the things you need to have before you approach the galleries. Do you need a resume, CD of images or a portfolio? Make the list and keep it in front of you so that you can make progress on all of the items you need to approach the galleries. When you are ready, submit your information based on each of the gallery guidelines. One week after you have submitted your information follow up with a phone call to the gallery. This is a very important step so don't skip it! I know what you are thinking ... wait, this takes more than 30 minutes! Of course it does. But today you should be able to start researching galleries and create a list of those you are interested in. Then create your database. And as time permits over the next month or so, continue to follow the rest of these steps. Day Nine of the Marketing Challenge is to pull out a camera and take a few demo photos while you are painting your next painting. You can use a nice camera or even your smart phone. Just make sure to crop the photos and post them on your blog and Facebook. They don't need to be fancy, just make sure they show how you painted the painting. Posting demos of your painting process is very important. Most people love to watch the step by step creation of just about anything so posting demo photos can really help you draw in your audiences. 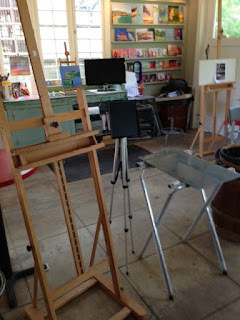 It is important to take as many photos as you can while you are painting in your studio. Then post the photos on your blog and Facebook page with a photo of the completed painting (for sale, of course!). After you have completed this task, post a photo of the completed painting below and include the link to your demo. I realize this may take you a few days so you can post on this blog post all week! By the way, if you are taking this month's webinARTs 102 class, today you will learn how to use a new APP that will automatically take photos for you on your iphone or ipad, at the timing intervals set by you! It's not too late to sign up! Pin It Everybody likes to buy paintings from an artist that is selling. So it is time to start talking about your paintings when they sell. 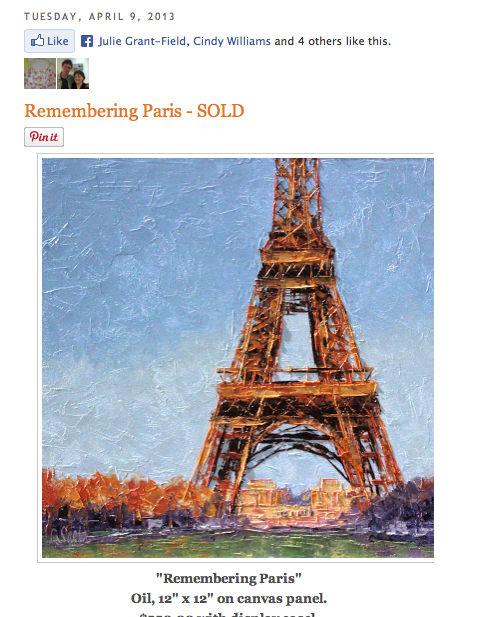 The Day Eight Marketing Challenge is to clean up your website and blog by marking any sold paintings as SOLD. It's not too late to do this. 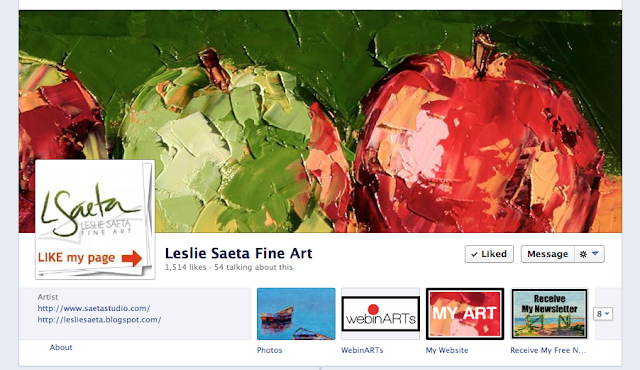 Red dots work great on your website or the you can just add the word SOLD in red below each painting. On your blog, you should add the word SOLD to the title of the blog post. That way when your blog post shows up on someone else's blog roll everyone will know it is sold. 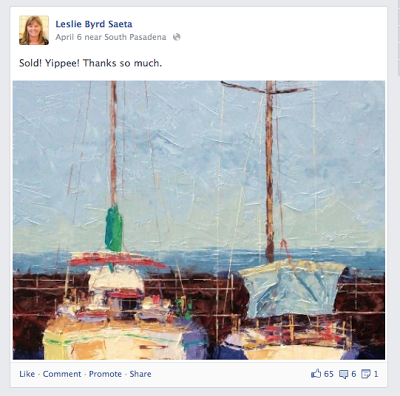 You also should post on Facebook when a painting sells. It's not bragging, rather you are just reporting really great news to your fans and collectors. It's easy to do as you can see below. Have fun with this task. And remember, when you sell a painting it is okay to tell everyone it sold!